主要著作 Isis Unveiled, 2 vols.,Theosophical Society, New York, 1877.: Theosophical University Press, Pasadena, California, 1976. The Secret Doctrine, 2vols, Theosophical Publishing Company, London, 1888.: Theosophical University Press, Pasadena, California, 1977. 参考文献 Symonds, John: Madame Blavatsky, Medium and Magician, Odhams, London, 1958. Shearman, Hugh: Modern Theosophy, TPH, Adyar, 1954. Kingsland, William: The Real H.P.Blavatsky, Watkins, London, 1928. Lillie, Arthur: Madame Blavatsky and her "Theosophy", A Study, Swan Sonnenschein & Co,m London, 1895. Barborka, Geoffrey A.: H.P.Blavatsky; The Light-Bringer, TPH, London, 1970. Cranston, Sylvia: HPB: The Extraordinary Life and Influence of Helena Blavatsky, Putnam, New York, 1993. 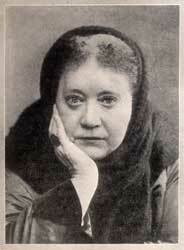 Bowen Robert: Madame Blavatsky on how to Study Theosophy, TPH, London, 1960. Williams, Gertrude Marvin: Madame Blavatsky, Priestess of the Occult, Lancer, New York, 1946.